Spoiler alert if you haven’t seen House of Cards season 2 completely!! The moment is kind of magical. I imagine. Walking into that room for the first time. “That room that breathes paranoia”. Walking into it for the first time even without anyone else other than yourselves. Walking into it as President Underwood. Even Clair was able to give her husband that moment to himself. Sending him into it on his own. Missing accomplished! 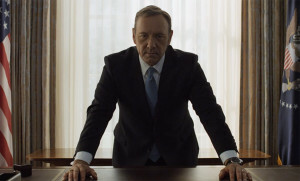 VP Underwood became President Underwood in the last episode of season two. 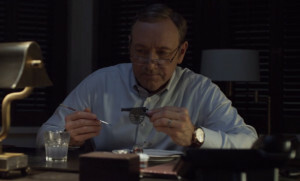 During that specific day, upon which Frank becomes the next President during an inaugural moment at Camp David, one can see that he is wearing a watch with a black or blue dial. Knowing that Kevin Spacy is a IWC fan and is probably wearing an IWC Portofino. A combination of material, colors and style I really like. During this second season tension between President Walker and Vice President Underwood grows to a new high and they won’t speak to each other for a while. At the top of that period of silence Underwood needs to break that in order to get to the good side of the president again. The way Frank achieves that goal is close to brilliant in my opinion. A might be a bit obvious maybe for some, but nevertheless brilliantly for others. In one of the final moments before president Walker gets impeached, both he and Frank have a phone call. During this phone call Frank is busy with his toy soldier army while consulting his leader. At that moment Frank wears another IWC watch. A bit more classic to my taste, it looks like an IWC Portuguese Automatic. Golden cast, white dial chronograph with a brown leather band. If you have any other opinions about House of Cards, the watches that are worn by Frank Underwood or anything else… Please let me know! « What watch does Jensen Ackles wear?